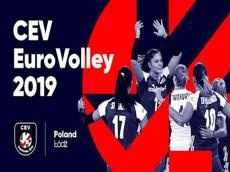 Azerbaijan have learned their rivals for the CEV EuroVolley 2019 Women. Azerbaijan are pitted against Hungary, the Netherlands, Croatia, Romania and Estonia in Pool C.
The competition will start on August 23 in Ankara, Lodz, Budapest and Bratislava with three matches at each venue and continue through the end of the group phase with another two matches a day. The tournament will reach its climax on September 8 at Baskent Volleyball Hall in the Turkish capital.